does not potentially contain within its mass, but only a hand obedient to the mind can penetrate to this image. The evolution of the human hand followed the development of our cognitive potential, which in turn allowed us to build our environments and grow our consciousness. Technique, imagination, creativity, failures and innovations combined to establish our sense of identity and especially the regime of representation that we enjoy today. The hand is an organ whose manifest externality expresses power whenever and wherever it appears. It stands for touch, grab, steal, hit, embrace, intent and signal. It is an accessory to greed, love, crime, and creation. 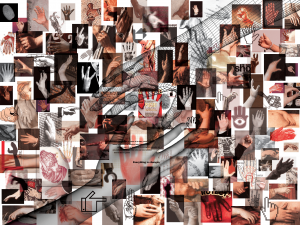 The hand takes power over viewers in all media, whether painting, mass media. As such it is also a proxy. While our minds can invent, dream, and scheme, our hands can make, and even more easily, destroy. In doing so, hands say more about us than our minds ever could, so what happens when the machines we invent can “affect” the world more easily than our hands ever could? While autonomous hands are being engineered every day for increasingly complex tasks, the human hand is being relegated to the task of simple clicks, merely existing as passive interface between our physical selves and the artificial environments we must navigate. Humans, things, interfaces and nature are meant to be touched. The more disembodied our world is becoming, the more we need that physical contact. The screen has become a convenient but weak surrogate way to do so. Mark Petrakis: The human hand trumps the power of the eye. It is the lever of gravity. One could argue that with the appearance of retina displays and eye tracking technology, it is the eye buried in its socket so close to our brains that will become the all important controlling device that determines how we see and manipulate the world. Were early humans more enthralled by the creative power of their hands than we are today? Optic vs. haptic vs. imagining vs. making. The art of representation has become the new making and therefore called for the eye to inherit the controlling powers of the hand, however, even in the age of virtual reality and on-demand creations, the power of watching is no substitute to the act of making, shaping and touch. The first image 50,000 years ago was one of hands. 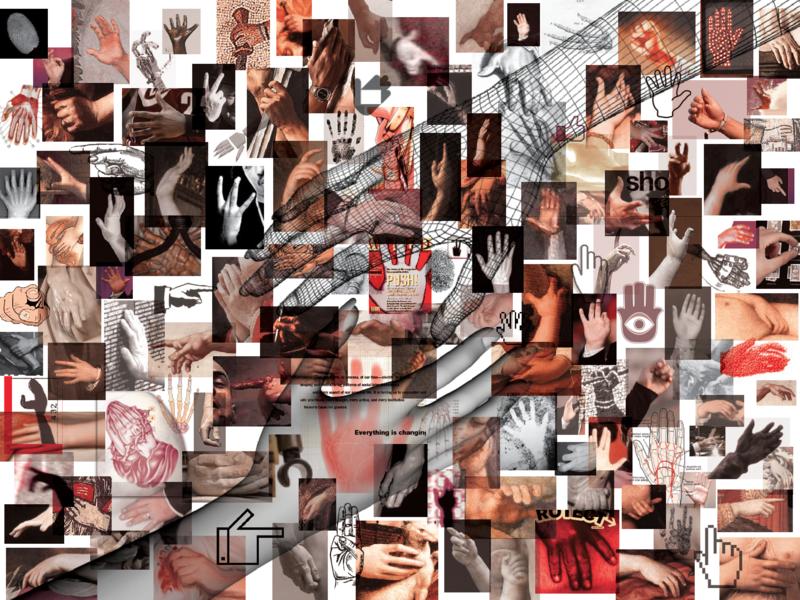 Today as well, to speak of image is to speak about hands—whether artificial or human. Marie-José Mondzain: Thanks to the victory of the iconophiles, we know that power is always visible, while authority, on the other hand, is essentially invisible.